Welcome to Jin Hwa Machinery Co. Ltd., the leading manufacturers of Embossing Rolls and Printing Rollers for pvc leather, pu leather, pe sheets, pvc sheets, pp sheets, glass, wallpaper, flooring and tissue paper. If you are looking for high quality, reasonably priced rolls for texturizing plastic, glass or paper, you have reached the right place. We make superior quality printing and embossing rollers and have several years of experience in serving the demanding requirements of our valued customers. View our embossing roller designs and patterns. 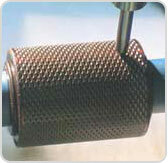 Our other products include surface cooling, heater roll, printing roller, mirror, calender-grinding and mirror, hard Cr. Roll, Leading roll, cooling roll, machine lead roll, hoge fan axle, cooling mirror roll. We are a company that is deeply committed to quality, service and reliability. Our website, is another endeavour in the same direction. We invite you to tour our site for information on our company, our products and our designs. Should you need any further information, please mail us or contact us. If you have any suggestions or comments about our website or how we can serve you better, please drop us a line here. Website Design and search engine promotion by Enablingbiz.com © Jin Group. All rights reserved.